Oklahoma’s state dinner might include chicken-fried steak as the main protein, but there’s probably no other meal more ubiquitous in Oklahoma than a good, mouthwatering steak. Whether you want an upscale dining experience or a more casual atmosphere, you’ll find a great cut of meat at these steak restaurants. If you’ve never experienced Cattlemen’s, you’re really missing out. The food is absolutely awesome, and the history just adds to the meal. 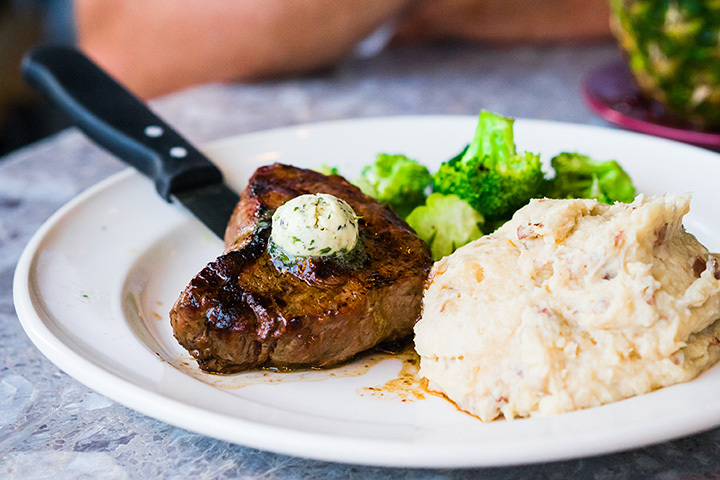 When they say, “The Perfect Steak,” they mean it. If you’re feeling adventurous, try the lamb fries as your appetizer. Choose your own flavor combination when you order your steak by selecting a crust and a sauce. If you like spicy and bold, the guajillo chile crust with the jalapeno béarnaise just can’t be beat. A personal favorite is the black truffle butter with the wild mushroom crust. Located on Route 66, Freddie’s has been serving barbecue sandwiches since the 1960s. Today, the restaurant is known for steaks and Lebanese sides, like hummus, tabouli and cabbage rolls. It still serves the barbecue it started out with, but the steak is really a treat. Think luxurious food in a posh setting that tastes gourmet but feels like comfort food. The hand-cut steaks have been aged to perfection, cooked to order and served with delicious sauces and sides. A baked potato might be the traditional paring with your steak, but step outside your comfort zone and get the au gratin potatoes or roasted carrots for a great meal. Mickey Mantle was born in Spavinaw, and this restaurant that boasts his name would meet his expectations of a fine steakhouse. Nature Source Beef provides the steaks, but the chef makes the meat sing when it comes to your table. When you’re in Bricktown, this is the place to go. Tallgrass sources all of its ingredients locally, which makes it one of the freshest places to get great steaks in T-Town. The philosophy of local inspiration carries through to the décor, as much of it focuses on Oklahoma history and artists. The pecan wood used in cooking the steaks on the grill adds to the already delicious food. The rib eye steak is the best one on the menu. Warehouse Willy’s has won multiple awards for their steak, including the 2000 Golden Fork Award for the best in the country. It’s an eclectic ambiance, so don’t feel like you need to dress up to come on over. You’ll want to get out your finest duds when you make reservations here. The restaurant is an upscale, modern take on the historic steakhouse. Duroc pork chops, New Zealand lamb chops and 30-day aged prime beef are just a few of the options you have. Make sure to try at least one of the 225 wine selections that pair perfectly with your dinner. Ranch Steakhouse is a fine dining experience that offers that old-world atmosphere with delicious steaks served with the sauce of your choice. Save room for their decadent desserts, like crème brulee or bananas foster. Molly’s Landing boasts the freshest seafood in the Tulsa area, but the steaks are some of the best in the area. The restaurant is a log cabin home kit that has been transformed into a great place for a meal. Enjoy a private dining room and arrive by helicopter for a really special evening.